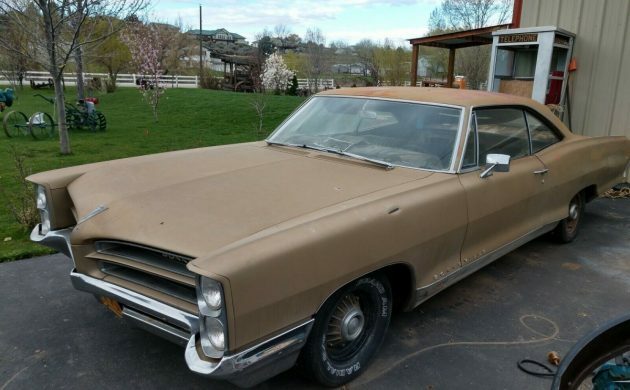 When it was new, this 1966 Pontiac Bonneville would have been a fairly special car, and if the next owner decides to undertake a full restoration, then it is guaranteed to be a car that will attract attention for all of the right reasons. 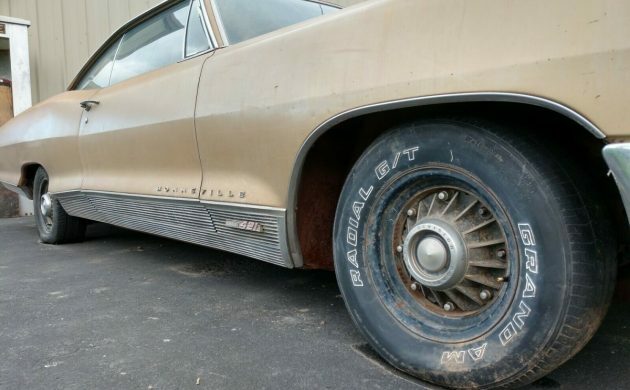 If you take a look at the Bonneville and decide that you just have to own it, you will find it located in Boise, Idaho, and listed for sale here on eBay. The owner has set a creative BIN price of $6,666.66 for the Pontiac, but the option is also available to make an offer. The first thing that I’ll say is that when it was new, the combination of the Martinique Bronze paint, the black interior trim, and those awesome 8-lug wheels must have really grabbed some attention. It appears that the paint is original, and the owner says that there is no sign of any previous repairs having been performed. 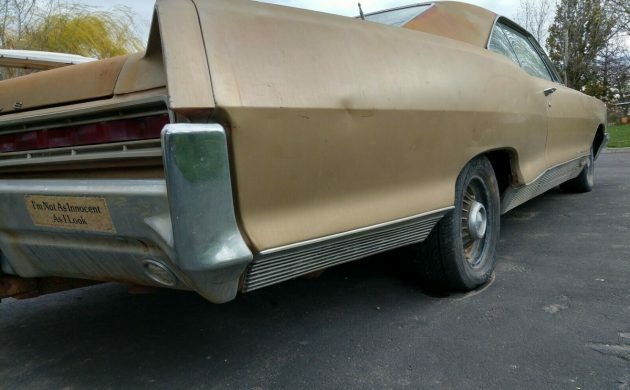 The body has a few dings and marks, but it really does appear as though this Bonneville is rust-free. The owner provides a nice photo of the underside, and there’s no undercoating or weird stuff down there. All that you can see is the factory finish, and it looks to be super solid. As the owner says, you will find a good supply of Bonnevilles of this era kicking around out there with a 389 under the hood, but this isn’t one of them. This one sports the original 421ci V8, which is hooked to a 3-speed Turbo-Hydramatic transmission, while power steering, power brakes, and air conditioning are also part of the deal. 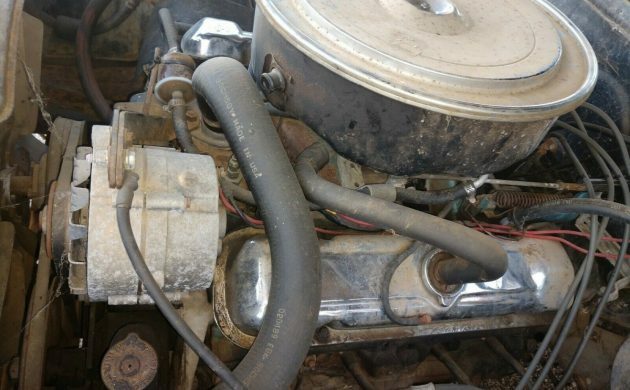 I get the impression from the text in the listing that the engine is original, and while it has been sitting for a while, some fresh fuel has seen it kick back into life. 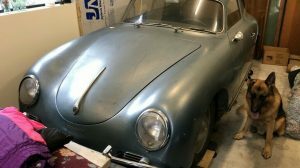 There’s no doubt that it will still need some work before it is ready to hit the road again, but the video below is of the day that he started the engine for the first time. This shows the engine running, and it sounds really clean and strong. The only interior shot shows a tiny corner of the dash, which is quite disappointing. I’d like to see what condition it’s in, but no luck there. We do know that the Bonneville has been fitted with an aftermarket wheel, and while it is fitted with A/C, it will need a new compressor. Sadly, that’s about all we know about the condition. What we do know is that apart from the A/C, the car was also optioned with a power antenna, power windows, and power seats. We’ve seen some pretty good restoration projects in the past, but this Bonneville looks like a real beauty. 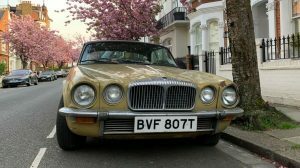 It is a solid car that still houses its original engine, and is fitted with a nice combination of optional extras. I really hope that someone gets their hands on it and is able to return it to its former glory. The bumper sticker says a previous owner appreciated what he had. Arm yourself – Crosses and Holy Water . EricG if you do go see it, I’m sure we’d love to hear your thoughts. I love it, but being east coast it’s too big a risk for me with just what’s there. Neat car! Looks like this guy took a pic at mile marker 66 somewhere and also has a shot with a bank/store thermometer reading 66° in the background. Cute, if obsessive, lol. I have a feeling the interior might be pretty shot on this one, but at least you’re ahead of the game on rust abatement. Interesting car. Am I seeing the video correctly? Is that gas shooting all over the engine compartment? A little dangerous I would think. Sellers seems oblivious. Lol, yeah, looks to be! That’s, uh… brave? 421 engine and 8 lug wheels aside I think this one is overpriced at $6,666. Low numbers car and reasonably clean from what we see and at this price it’s a steal. Like to pull the trim off the rockers and see what’s underneath though, breeding ground for tin worms. Easy to swap in a four speed too, nice Poncho. If the car is native to this end of the country there should be no cancer problem. Rust usually isn’t a problem out usually unless it sits outside on the coast with a few exceptions such a 58 Ford my Dad bought new in Portland Or. 421′ s don’t grow on trees, this is kind of a deal. He has lowered the BIN price. 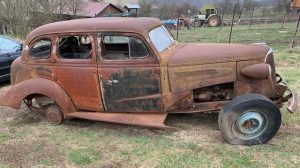 This car may need a lot of work, but it looks to be rust free. 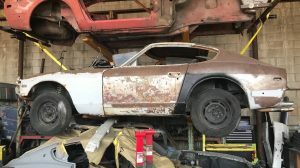 Sure will be a beautiful beast when restored. I hope someone snatches it up. A 2+2 would be pretty much the same car, but with the slightly shorter Catalina body vs the Bonneville long B-body with extended rear overhangs, the Bonneville did have the wood insert in the dash and nicer seats.